Barcelona is spread over about 100 sq kilometers. This is an introduction to the neighborhoods and some towns nearby. Prices. There’s no standard or ‘market price’ as the buildings and flats differ too much in condition and layout. The comments here are only a guide. Comparing the Price. As a very general average, apartments in Barcelona are about 50 to 100% less than in Paris, New York City and London and about the same price as in Rome, Amsterdam and Madrid. It’s very reasonable for a large European city on the sea. Transportation. No car needed! You can walk almost everywhere and theere’s an underground train (Metro) connecting the neighborhoods. There are also several bike lanes and a public bike system (Bicing). 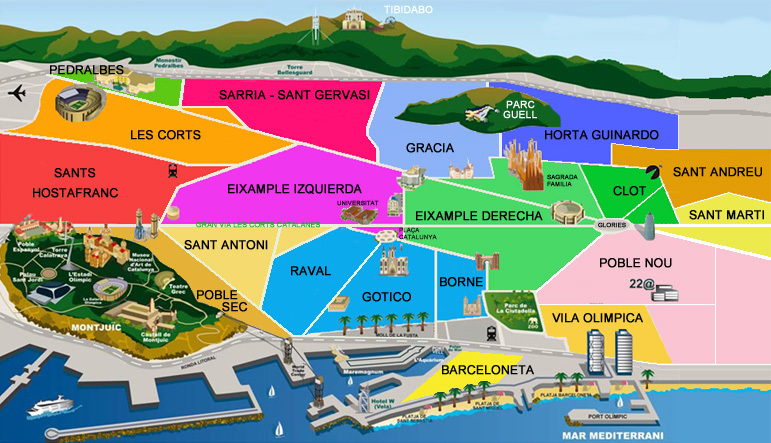 In the map of Barcelona below, we’ll start in the upper middle at Gracia and go around clockwise. 1) Gracia. A trendy barrio that used to be a separate town. It’s narrow streets and large plazas retain a village-like feel. Lower Gracia is walking distance to the city center and offers an array of shops, bars, cinema and restaurants making it a nite-life haven. Due to its centrality and popularity prices here are slightly above the Barcelona average. 2) Horto Guinardo. This encompasses the hills that surround Barcelona and Parc Guell. Demand is lower as it’s further out and hilly. The prices generally reflect this. It features some large, green parks and a wide-range of flats. It’s becoming more popular as the prices in other areas go up. 3) Eixample Derecho. This large grid area was built in the late 1800’s. It’s easy to navigate with broad, parallel streets and a variety of beautiful buildings and flats. It’s a high-demand area due to its convenience, schools, medical facilities, stores, etc. Prices vary depending on the street, but in general it’s above average, especially for flats over 90 sq meters. Look for fixer-uppers for a good price. 4) Clot. Extends to the north-east of Eixample and eventually loses the grid pattern. Prices drop sharply. It has several quaint streets, plazas and neighborhoods. A good place to find a nice flat at a reasonable price. The only real difference is distance to the city center. 5) Sant Andreu. Becoming very popular, it’s comprised of local residents with little tourism. There’s less demand here as you move away from the city center so you can find larger flats for good prices and plenty of fixer-uppers at low prices. A good place to get a great deal. 6) Sant Marti. Like Sant Andreu, it’s mostly native residents, little tourism and flats at reasonable prices. Plenty of schools, shops and stores. Some online search portals list Poble Nou as part of Sant Marti. 7) Poble Nou/Villa Olimpica. This stretches along the beach and has become very popular. There are some warehouses and small factories owing to its industrial past, but it’s undergoing major renovations with new apartment buildings going up everywhere. Amazon recently announced a new distribution center there. Prices have increased recently especially near Rambla Poble Nou and close to the beach. As you go back from the beach, you’ll find a broad range of flats and at decent prices. 8) Barceloneta. A small area right on the beach, it used to be a fishing village. Almost all the buildings have the same layout with small one-bedroom flats. Like most areas, there’s ongoing construction and larger flats being built. It features a mix of foreigners and natives and a unique feel as a town of its own. It’s for beach lovers. Flats go for around 200k€. 9) Born. We’ve crossed into the ‘old city’ (Ciutat Vella) where you’ll find buildings dating back 400 to 150 years and several enchanting plazas, cobblestone streets in a medieval atmosphere. It’s well-kept with an assortment of interesting shops, bars and restaurants. Due to its popularity, it’s a little more expensive than the rest of Old City. 10) Gotica. The historic center holding the remnants of Barcelona’s Roman past. There’s plenty of tourists, an active nightlife and the ‘Ramblas’. There’s also a wide range of buildings and flats (some nice, some not) at a variety of prices. You must check the building’s condition as flat owners have to pay for building repairs and they’re not cheap. I have clients who love it here. 12) San Antoni. Like Eixample, this area is set out in a grid making it easy to navigate. It’s very residential, appeals to all age groups and has a nice pedestrian areas. There’s a wide variety of flats and the prices tend to be less than in Eixample. 13) Poble Sec. This area has become very popular with local and foreign buyers due to the park (Montjuic), proximity to the city center and low prices. It’s a little hilly and crowded, but offers a variety of flats; some OK, some not. It stretches to the harbor and has a large pedestrian zone running down the middle. It’s up and coming and a good investment. 14) Eixample Izquierda. Very similar to the Eixample Derecho, it’s a large grid area and covers several neighborhoods. It’s central with large train stations, hospitals, schools, etc. To meet the demand, prices are quite high, especially for larger flats. As always there are some fixer-uppers and other deals to be found. 15) Sants Hostafranc. As you move out of Eixample you lose the grid pattern but also the high demand. This is a pretty cool area with winding, narrow streets, mostly local residents and reasonably-priced flats. The buildings are older, but prices much more affordable. Becoming very popular. 16) Hospitalet (not on the map). This is a separate town from Barcelona located about three train stops to the left (south) of Sants. It’s densely populated and can feel a little crowded, but you can buy a lot more flat for your money. More and more clients are buying there as the prices (and rents) go up in Barcelona. They tell me they like it. 17) Les Corts. Home to Camp Nou soccer stadium where the famous team plays, it’s very urban with wide streets, wide sidewalks and a large variety of buildings. As with the rest of Barcelona, there’s plenty of new constructions going up. It’s similar to Eixample in price and demand. 18) Pedralbes. An exclusive residential area with luxury buildings, plenty of open green areas and high prices. Several private schools and colleges such as ESADE and IESE are here. The train doesn’t reach so you’ll need a car (or take the bus). 19) Sarria/Sant Gervasi. Sarria used to be an independent town and retains its village-like quality. A few blocks away is San Gervasi, an upscale residential area popular with local families. It’s up on the hills so demand drops a little bit, especially among foreign buyers. There’s a wide variety of flats, but the prices are quite high. 1) Sant Just Devern / Esplugues de Llobregat. These towns are just south of Barcelona (left of Les Cortes), about 25 minutes by car, depending on traffic. They’ve recently expanded the tram, an above-ground train, so it’s much more accessible. You find mostly attached ‘townhouses’ and a few detached homes, some with pools. Popular with foreign families because the American and German schools are in Esplugues. Not cheap but good deals can be found. 2) Castelldefels. This is a beach town south of Barcelona. There’s a train to Barcelona every 20 minutes. It has a mile-long sandy beach and the British School of Barcelona so it’s very popular with foreign families and tourists. The prices are quite reasonable so a good place to invest. It’s cheaper than Sitges, but the town’s not as nice. Perfect for a vacation home. 3) Sitges. A charming village about 30 minutes in train from Barcelona. Beautiful and well-kept with two mid-sized beaches. Demand is higher so prices are about the same as the nicer areas of Barcelona. A lot of foreigners live here and in the residential districts nearby. 4) Badalona. Located to the north of Barcelona or to the right of Poble Nou on the map. It’s connected to the Metro system so no car needed. Historically an industrial center, it has a large beach and boardwalk making it popular with foreign buyers. A good place to find a great deal on a decent-sized flat. The only drawback is distance to Barcelona. Take a walk through the various neighborhoods of Barcelona to get an idea of where you want to buy. Prices have been going up in 2018 and the realtors say they won’t be coming down for a while, so it’s good time to buy. Please feel free to call or send a What’s App message to +34 664 665 365 or email if you have questions. Interested in a vacation home in Barcelona, Spain.